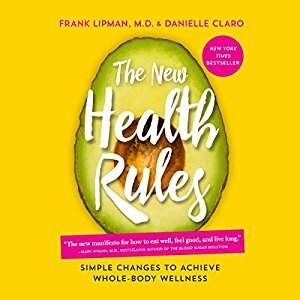 The New Health Rules: Simple Changes to Achieve Whole-Body Wellness [Audiobook] | Free eBooks Download - EBOOKEE! Posted on 2018-04-29, by perica123. Frank Lipman MD, Danielle Claro, Chris Andrew Ciulla (Narrator), "The New Health Rules: Simple Changes to Achieve Whole-Body Wellness"
Dr. Frank Lipman is at the vanguard of a revolutionary way to deliver medical care (O, The Oprah Magazine). A leading expert in the field of functional medicine, he focuses on the root causes of illness and guides his patients to the deepest, most lasting sources of wellness. In this audiobook, he and co-author Danielle Claro make life-changing health advice available to all. They wade through the often contradictory information that bombards us daily and deliver more than one hundred actionable tips that will improve every aspect of our health - body, mind, and soul. Listeners will learn simple rules for getting a good night's sleep, why a daily dose of sunlight is crucial, and which toxic cosmetics and kitchen products should be tossed. Here, Lipman and Claro teach us which foods help prevent Alzheimer's, why sugar is so destructive, and how to bring good bacteria into the digestive system - providing an arsenal of easy-to-process tips and guidelines to make us stronger, healthier, and happier. No comments for "The New Health Rules: Simple Changes to Achieve Whole-Body Wellness [Audiobook]".